Perth events for kids | Events - Kids Are Kids! Here you’ll find upcoming group programs and special events. ActiveAte is a group designed to promote wellbeing through teaching parents how to support their child to explore food and increase physical activity. Parents come together to learn and share strategies to progress their child’s engagement in meals. Children will join in fun movement activities and learn how to explore food in a positive way. This group will be hosted by two of our therapists. The content of the group has been developed by Occupational Therapists, Physiotherapists, Speech Pathologists, Clinical Psychologists and a Dietitian. The program is made possible and has been subsidised for families by funding from the Helen Leech Endowment through Perpetual’s IMPACT Philanthropy Program. Kids Are Kids! 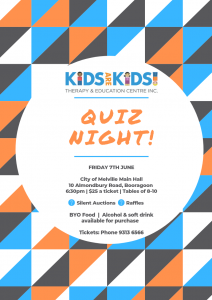 are thrilled to be holding a Quiz Night on 7 June 2019 at The City of Melville Main Hall. Everyone is welcome, bring your family and your friends for a fun night out and a chance to catch up on some trivia and win some amazing prizes! Silent auctions available by cash or card. Raffles available by cash only. BYO food for your table of guests to share. Alcohol, soft drinks and water will be available to purchase. All proceeds raised on the evening will be helping Kids Are Kids! to make programs and services accessible to all families. We thank you for you support and look forward to a great night! Tickets are just $25 per person and are available by calling our administration team on 9313 6566.